Cuando su crucero llegue al puerto de Atenas, pruebe la cocina griega clásica en una excursión a pie de 4 horas. 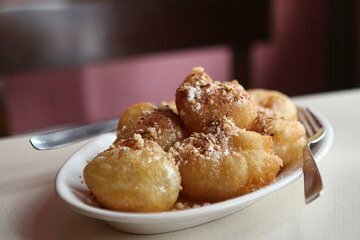 Pasee por las calles históricas y haga varias paradas de comida para degustar atractivas especialidades locales como deliciosas bolas de "loukoumades", más pan de "koulouri", salchicha "pastourma" y mucho más. Sumérjase en las panaderías, las lecherías y las tiendas de dulces, y descubra las populares frutas griegas, hierbas y especias en un paseo por el bullicioso mercado de alimentos de Varvakeios. Los números se limitan a 14 en esta excursión en tierra para grupos pequeños, lo que garantiza la atención personalizada de su guía. Excursión de 4 horas por la orilla de la comida de Atenas. Disfrute de un recorrido a pie por el centro de Atenas con un guía local experto en comida. Aprende sobre la cocina griega clásica y las delicias con una guía experta. Tour en grupo pequeño limitado a 14 personas para una experiencia más personalizada. This was a fantastic tour in spite of a rainy day in Athens. We ate street food, sampled different foods in small shops, ate pastry in a friendly café, and topped it all off with a huge gyro in a cozy restaurant. At the start of our tour there was a difference in the pick up time at the end and the time stated in our voucher but it was worked out with our tour guide and our taxi driver and at the end of the tour our driver was exactly where he promised to be to pick us up. Great tour! My only advice would be do NOT eat breakfast! You will get TONS of food throughout the tour and then end with a Gyro lunch... so come hungry! Great alternative tour and a unique way to see Athens. TONS OF FOOD, GO HUNGRY! If you like to eat and this is not your first trip to Athens or you're looking for something different, consider this tour. Our guide was knowledgeable and entertaining as she led us through back streets, food markets and specialty shops to taste and learn about the food culture of Greece. We enjoyed nibbles and samples throughout the morning as we walked off the calories we consumed! Great guide, great foodie experience. The food tour of Athens was a highlight of our trip to Athens. The group was small and the tour guide interesting and well versed in Athens history. The food was excellent and we had plenty of time to walk the calories off. After the tour we had time to visit the new Acropolis Museum which is a must to see. You walk over the excavated market area of Athens on glass floors a real experience and quite exciting. slow down.In fact one of the person on the tour tripped and fell. We maybe at the most visited 6 vendors. didn't what to be here. Had much better food tours than this. Great experience , great way to see the real Athens . Food was fantastic , guide informative and day was very pleasant . Pick up and drop off at cruise port was flawless .definately a great day . This was an excellent, walking tour. You will get plenty of food and information. It was first thing in the morning so I suggest you don't eat a big breakfast. There is a lot of walking on this tour. Great way to spend limited time in Athens.